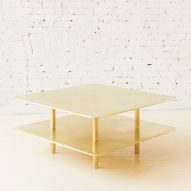 New York studio Fort Standard has launched a set of easy-to-assemble metal furniture, including a raw brass side table and a white powder-coated shelving unit. 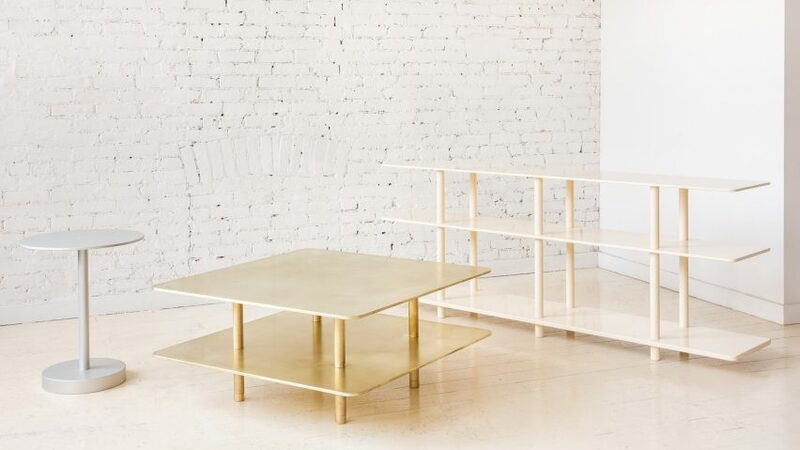 The Strata collection, featuring a coffee table, side table and low shelf, launched as part of the Fort Standard's Moments of Discovery exhibition at New York design store Colony earlier this month. 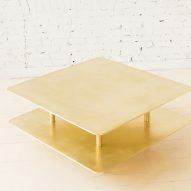 To create the lightweight furniture, the studio's founders Gregory Buntain and Ian Collings experimented with machining metal. The modular collection's vertical elements are made of metal rods that slot together, and the tops and surfaces comprises thin, milled metal plates. It contrasts the designers' heavier previous collections, which have celebrated natural materials, like stone, wood and leather. Fort Standard selected a wide range of materials and finishes for the pieces – showcasing the coffee table in silver anodised aluminium, the side table in raw brass, and the shelves with an off-white powder coating. The Pine Dining Table, the first piece from the studio's upcoming collection, was also on show as part of the exhibition. 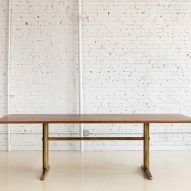 The long table features a metal base, described as "hefty", paired with a dark hardwood top. 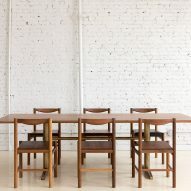 Both the Strata furniture and the Pine Dining Table are designed to be easily assembled, a response to the often difficult access to New York apartments. 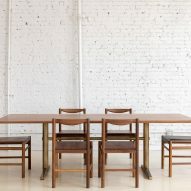 The furniture was shown at Colony, 324 Canal Street, on 4 May 2017 as part of the citywide NYCxDesign festival taking place 3-24 May 2017. An exhibition of lighting by Lindsey Adelman, and a showcase of furniture and homeware by all-female designers, are also on show during the festival. 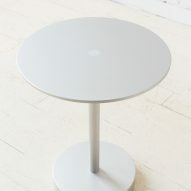 Fort Standard's earlier designs include aluminium bowls raised on slim piers and a set of stone-shaped wooden building block toys. Photography is by Brian Ferry.